If you grow up around a small engineering business you are likely to gain something of an appreciation for power tools. You’ll see them of all ages, sizes, manufacturers, and technologies. When thinking of the power tools constantly on hand in the workshop of a blacksmith like my dad for instance, I’m instantly seeing a drill and an angle grinder. 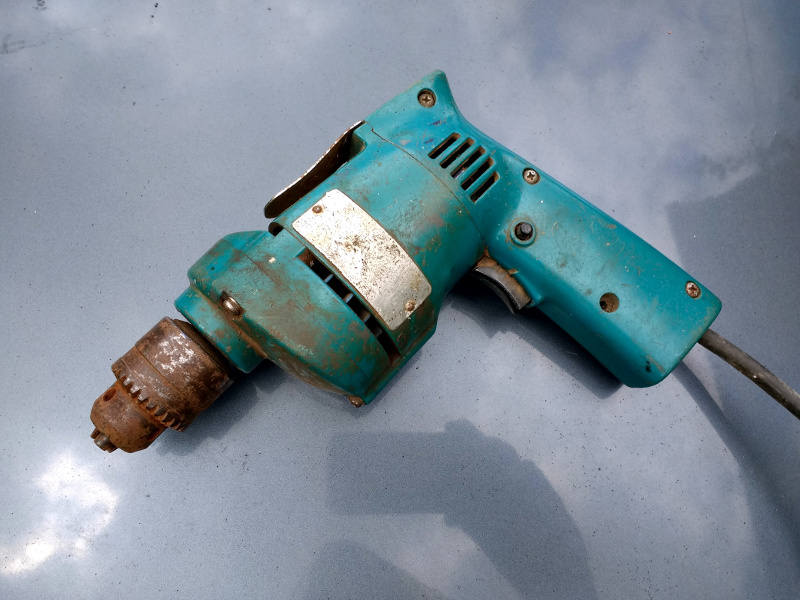 The drill that most comes to mind is a Makita mains powered hand drill, and given that I remember the day he bought it to replace his clapped-out Wolf in 1976, it has given phenomenal service over four decades and continues to do so. Of course, the Makita isn’t the only drill in his possession. A variety of others of different sizes and speeds have come and gone over the years, and there is always one at hand for any given task. The other one I’d like to single out is I think the most recent acquisition, a Bosch cordless model he bought several years ago. It’s similar in size and capabilities to the Makita save for its bulky battery pack, and it is a comparably decent quality tool. So, we have two drills, both of similar size, and both of decent quality. One is from the mid 1970s, the other from the end of the last decade. One is a very useful tool able to drill holes all day, the other is little more than a paperweight. The vintage model from the days of flared trousers is a paperweight, you ask? No, the not-very-old Bosch, because its battery pack has lost its capacity. The inevitable degradation due to aged cell chemistry has left it unable to hold enough charge for more than maybe a minute’s use, and what was once a tool you’d be glad to own is now an ornament. 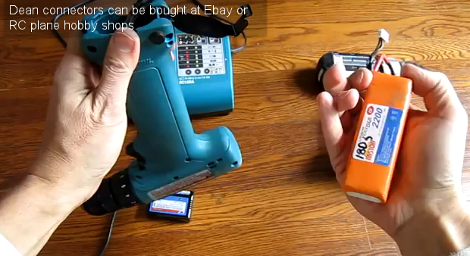 YouTube User [Vuaeco] has come up with a novel idea, combining power tool battery packs to double the capacity. Starting off with two slimline 2.0Ah compact battery packs, [Vuaeco] wanted a larger 4.0Ah rebuilt drill battery pack. These battery packs are different in size so it wasn’t just a case of adding in more cells in empty slots, instead he goes on to show us how to connect the batteries in parallel using some thin nickel strips. Once completed he modifies the battery casing so it fits another stack of batteries. He does this by bolting the top and bottom together with long screws, and insulating the otherwise exposed battery terminals with insulating tape. The final product isn’t as aesthetically pleasing as a real battery pack, but it looks good enough. There are a few things we might have done differently, for instance providing some hard plastic around the insulation so should the battery get knocked in an awkward position it would still have a hard shell protecting it. Also, instead of combining the batteries together fully charged as the video suggests, we might have done the opposite approach and fully drained them, avoiding unnecessary risks. If you try this, how about giving it a 3D printed case? [Shashank] has a modest tool collection but is missing a rotary tool. He needed one for a project he was working on but didn’t think that it would get much use after the current project was completed. So instead of buying a rotary tool, he decided to make one to get the job done. The project started out with a 40mm PVC pipe that would serve a the main body of the tool. Two MDF disks were cut to fit inside the pipe. One was used for mounting an RC vehicle brushless motor and the other was bored out to accept a pair of bearings. The bearings supported a modified pin vise that acts as the chuck for securing rotary tool bits. A 20-amp ESC and a servo tester control the motor’s speed and can get the motor up to 18,000 rpm. Although this worked for a while, [Shashank] admits it did fall apart after about 20 hours of use. The MDF bearing mounts crumbled, thought to be a result of vibration due to mis-assignment between the motor and pin vise. He suggests using aluminum for the bearing mounts and a flexible coupling to connect the motor to the pin vise. If you’re interested in making your own rotary tool but don’t have any spare motors kicking around, this 3D printed vacuum-powered rotary tool may be for you. Cordless power tool battery replacements are expensive: you can easily spend $100 for a NiCd pack. [henal] decided to skip nickle-based cells and cut out the middleman by converting his old cordless battery packs to inexpensive hobby lithium cells. These batteries appear to be Turnigy 3S 1300mAh’s from Hobbyking, which for around $10 is a great bargain. As we’ve explained before, lithium batteries offer several advantages over NiMH and NiCd cells, but such a high energy density has drawbacks that should be feared and respected, despite some dismissive commenters. Please educate yourself if you’ve never worked with lithium cells. [henal] gutted his dead battery packs and then proceeded to prepare the lithium replacements by soldering them to the cordless pack’s power connectors. To keep charging simple, he also branched off a deans connector from power and ground. After cutting some holes in the pack for access to the balancing connector and deans connector, [helan] went the extra mile by soldering on a DIN connector to the balancing wires, which he then securely glued to the side of the case. We’ve featured lithium power tool replacements before, and these Turnigy packs pose the same problem: they don’t appear to have any low voltage cut-off protection. Check out some of the comments for a good solution. [HammyDude] was tired of buying replacement batteries for his power tools. He had some Lithium Polymer batteries on hand and decided to take one of his dead drills and swap out the dead power pack. The orange battery pack you see above has a deans connector on it for use with RC vehicles. By opening up the drill housing, [HammyDude] was able to add the mating deans connector. Now the replacement easily plugs into the drill, and it even fits inside the handle body. This battery is made up of several cells, and an inexpensive charger is capable of topping off each individually for a balanced charge. In the video after the break [HammyDude] points out that the Makita charger applies voltage to all of the cells in series. It’s incapable of balance charging so when one cell dies the battery is toast. We’ve encountered this problem with Makita tools before. One drawback to take note of in the end of the video: this replacement doesn’t have any low voltage cut-off. Running this battery pack down too low will permanently damage it. There must be a simple circuit that could be added as a safety measure. If you know of one, drop us a tip.